Emotion and reason: that is style and technology. Together with a winning and courageous choice of strategy. A strategy which LeoVince intends to use to accompany its customers from the first scooter to the heights of the motor biking sector; with a series of products, that in line with their intended use, all have the same visual impact and make use of the same materials. This is the overriding concept behind the new Scoot GP system family, destined for 2-stroke scooters. ZX: High performance evolution. The LeoVince Scoot “ZX” range represents a medium level evolution of the Scoot Racing range. This craft produced product is suitable for competition use but can also be used on the road as it is CE marked. The system consists in an expansion chamber made of special 10/10 mm steel. Featuring an “open”, double-chamber structure, with interspaces covered in deadening material. It is varnished to ensure excellent protective potential against the elements, whilst at the same time leaving all the machining visible. The rounded silencer is made of stainless steel skinned in carbon and Kevlar. The ZX is also available with chromed expansion chamber which as well as making the product more durable also enhances its overall look. The kit also contains a set of springs and rollers to boost the variator performance according to the particular features of the exhaust and engine for which it has been developed. TT: Multi-coloured economy. The LeoVince Scoot “TT” range is the top range of sporting exhaust systems of the Scoot range which manages to combine high performance, quality design at competitive price levels. The CE marked system features an expansion chamber made of 10/10 mm steel with an “open” double-chamber structure, combined with a rounded shaped silencer made of stainless steel and shiny aluminium skinned. H.M. "V6": Give your 2-strokes engine a boost! V6: Added verve for the two-stroke engine: The LeoVince Scoot “V6” range is specifically for 2-stroke 50 cc gear motors for enduro, cross, supermotard and road bikes. The CE marked system consists of an expansion chamber made of 10/10 mm stainless steel and which has a double-chamber “open” structure with inter-space covered in deadening material. 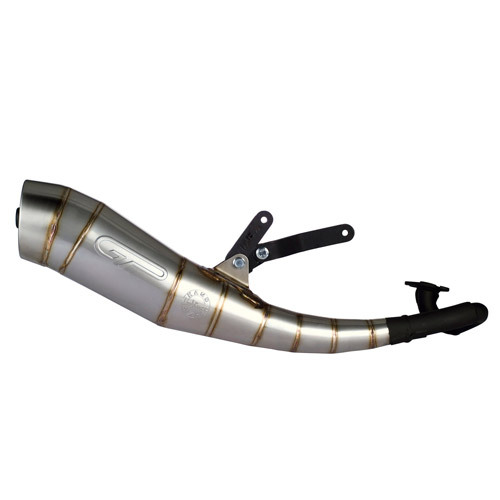 The expansion cones have been manually TIG-welded, and thanks to the transparent varnish finish give the whole exhaust a truly sporting look. The titanium- skinned silencer features an oval sump, with no projections in the “Off-Road replica” version and with spout in the “GP Replica” version. In terms of performance, it offers a considerable increase in the power and maximum speed levels of the engine, which ensures enhanced power delivery and speed levels. 70: Pure racing-…. ! The LeoVince Scoot “70”; the number indicating the technical destination of this product, for supercharged 70 cc scooter engines which are specifically used for competition racing and are therefore not homologated for road use. A special series, which constitutes an important stage in the preparation of a racing engine. The expansion chamber is sold without any added volcanic mass kit, to allow technicians to regulate the bike according to the actual circuit conditions. The expansion chamber itself is of enlarged size, with a cone/counter cone structure, and made totally of stainless steel for the first time using craft workmanship and visible TIG-welding. The silencer of the system features a stainless steel interior with titanium skin. The attachment of the header pipes to the cylinder is by means of a screwed flange together with two springs used to reduce the vibrations level and the danger of breakage under extreme conditions of use. The clear aim of the exhaust being to improve performance at the highest speeds. ZX-R: the new frontier in high performance. Performance, design and carbon for the new expansion chamber from LeoVince Scoot that wants to rethink its super sport. Silencer: large-size stainless steel body with enlarged exit pipe. Covered in carbon fibre and attached with an Aluminium clamp. Expansion chamber body: made of special 10/10 mm steel, featuring an “open” double-chamber structure covered with deadening material. Its cones (up to a maximum of 9) are TIG hand-welded. When the construction has been completed, a transparent varnish is applied that protects the expansion chamber from the elements, whilst at the same time enhancing its racing design by leaving all the welding visible. Homologation: the ZX-R expansion chamber is CE marked, so it can be used on the open road. Additional equipment: The ZX-R kit also contains a set of springs and rollers to boost the variator performance according to the particular features of the exhaust and engine for which it has been developed. Vintage: a very special Italian meeting. The all-Italian encounter between LeoVince Scoot and the Vespa GT 4-stroke range was something not to be missed. 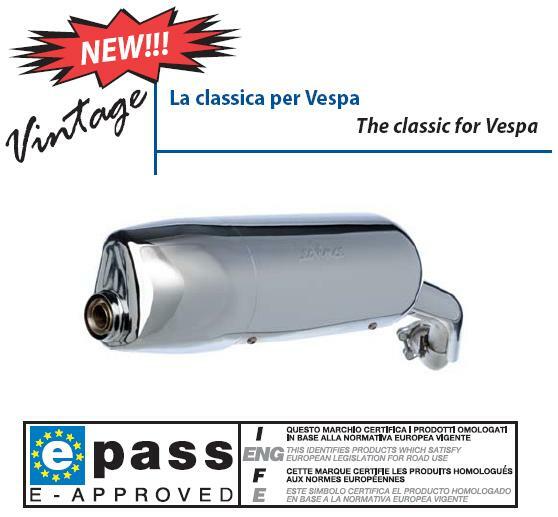 The featured item is a new special type-approved exhaust in which tradition and innovation meet. The product consists of two basic parts: the central body including manifold, made entirely from AISI 304 stainless steel and a chrome casing that covers the body and the manifold, thus ensuring an elegant and aesthetic effect in keeping with the personality of the two vehicle product lines. The silencing effect is obtained by a chamber system together with a sound absorbent material that is particularly resistant to high temperatures. The exhaust is fitted with the dB-killer device. It should be pointed out that, while being well within the legally required sound limits, the system expresses its own gutsy sound quality, in true Gran Turismo style.